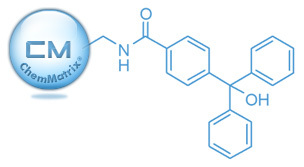 Trityl-ChemMatrix® is mainly used to obtain a protected peptide cleaved under low TFA conditions (under 1%). This resin therefore has the same cleavage conditions as the Cl-Trityl-polystyrene. Trityl-ChemMatrix® resins are offered preloaded will all 20 natural amino acids. Other amino acids can be preloaded on special request. Please take note that the Cl-Trityl-ChemMatrix® resin is not offered for stability reasons. You have the possibility to start with the Trityl-OH-ChemMatrix®, chlorinate the resin yourself and then add the amino acid you desire. Important notice: Please take note that the ChemMatrix® resins swell more than polystyrene resins. Make sure to have reaction vessel that will allow a higher volume to avoid any overflowing.